Has anyone published statistics on how many recounts (i.e. runoffs) are necessary for resolving an instant runoff election, versus the number of candidates? Data from real life would be good, but simulations would also be interesting. Also of interest: how often do ties occur? 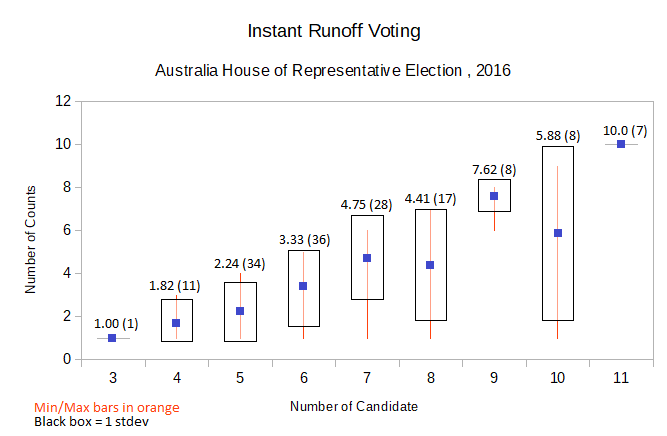 I just ran the following analysis based on the 2016 House of Representatives Election in Australia. It shows a slight correlation, however it also shows a significant standard deviation within electorates with the same number of candidates. Most candidate counts had at least one electorate decided on first preferences, and most had at least one decided on two-candidate preferred. Source of raw data: Australian Electoral Commission. Method: The electorates were grouped based on the number of candidates nominated in the 2016 election. The number of counts required for a candidate to reach 50% of the vote was determined for each electorate, and then the average, min/max and standard deviation was calculated within each group. In Australia, each count results in the elimination of exactly one candidate. For the sake of avoiding ambiguity, the first count is the first-preference, and the second count is the first runoff. Not the answer you're looking for? Browse other questions tagged voting-systems statistics or ask your own question. Is single transferable vote an adaptation of instant runoff voting for multiple winners? What are the statistics for mass shootings by skin color? How does Score-Runoff (STAR voting) compare with plain Score voting?